I’ve been thinking a lot about weddings and flowers because of two reasons. First, my mom is planning her cherry blossom themed wedding and I get to help : ) Yay maid of honor! Second, my husband and I are having our first wedding anniversary at the end of the month. So that made me think back to planning our wedding. I made some fabric flowers that I ended up using to decorate our place card holder and some other things. I have a few of the fabric flowers left, so I’m going to use them to decorate other things! Today I’m going to make a yarn necklace adorned with some of these flowers. Someday I’ll do a tutorial on making the flowers. 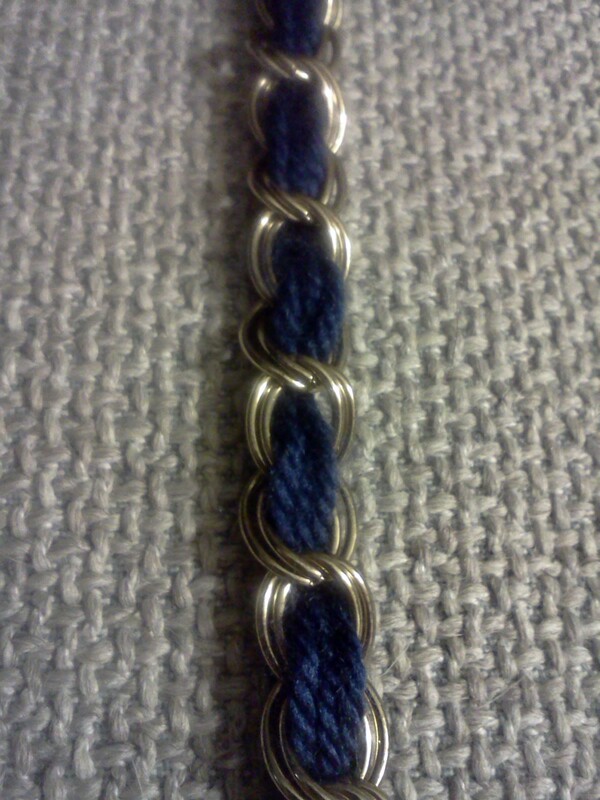 I’m also making a nautical braided yarn necklace. This is a super easy one, ladies. First, cut a piece of yarn a few inches longer than you want your necklace to be. Now, cut several pieces of yarn the same length. Separate the strings into three equal groups and tie each group together at the ends. Braid the three groups of yarn together. You can also leave it loose instead of braiding it. You can even braid some strings and leave others loose. In my nautical necklace, I only braided one (each group of yarn had seven strings in it). On my flower necklace, I used one big braid and two longer braids that each only used three strings total. Tie the end of the braid when you’re done. Once you put your yarn together, tie the ends together using little scraps of yarn. Cut any strands that are sticking out. Then, cut a very long string of yarn. Tie the end of it around the back of your necklace. Starting at one end of the back of your necklace, wrap the long string of yarn around the ends that are tied together. This covers the ugly area where the ends of your necklace are tied together. Once you cover it all, tie it off and tuck the end into your wrapped yarn. I like how this looks, but you can also leave extra yarn at the ends of your braids and tie the yarn into one big bow. Once your necklace is put together, add the embellishments. For my navy blue nautical necklace, I bought these little gold anchor buttons. So cute. I decided to put my fabric flowers on a coral yarn necklace. You can put a few embellishments together in one spot or have individual flowers or buttons spaced apart. Again, I tried both. And I like both. Just use your hot glue or needle and thread to attach the embellishments. Don’t use too much glue, and if you use thread make sure it will blend in with the color of the flowers. Ta-Daa! Now you have an adorable yarn necklace… or two! By the way, I’m kind of in love with my new nautical necklace! Thanks to my amazing husband who took these awesome pictures! I’m building up my jewelry collection because I know it’s an easy way to jazz up your wardrobe. I’m starting med school in August and I probably won’t have very much time to make myself look cute. Jewelry takes less than a minute to put on and after you do, it looks like you put quite a bit of effort into your appearance. I already bought some new jewelry, but I’ve also decided to make some. 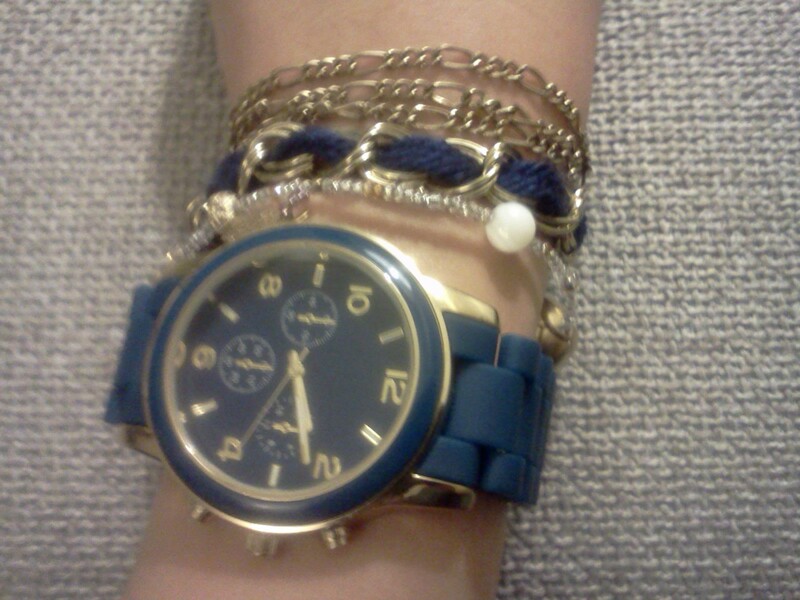 While at Hancock Fabric earlier today, I found a simple gold chain bracelet for under a doller. It’s cute, but not cute enough. 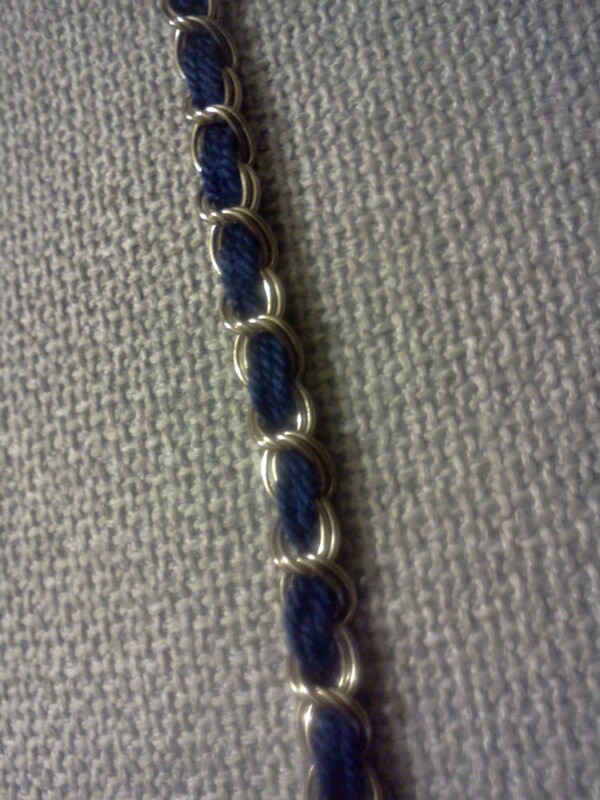 I also bought some navy blue yarn for a different project. I decided to combine the two. All I did is weave the yarn through the links three times. Then I tied off the ends. Super simple! Here’s the final product. I think it has a bit of a nautical look 🙂 You can do the same thing with necklaces too! And here it is paired with some other jewelry.